This next deed is the one mentioned by Edward in his pension inventory dated August of 1820. This is the deed of land to Edward’s wife from Charles K. White. It is very interesting to note this appears to be the same land Edward sold to Charles 2 years prior. What does this deed tell me? 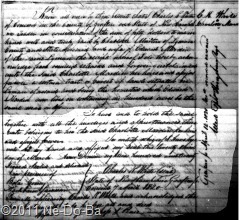 The deed is dated 20-Mar-1820. The deed is recorded 7-Apr-1820. The deed is from Charles K. White a trader from Concord (Lisbon). The deed is to Charlotte Marden of Lyman, wife of Edward Marden of Lyman. The property was sold for $50 and the money was paid at the time of sale (no mortgage). This is a Quit Claim deed. The land is 100 acres in Lyman and is “the homestead which Edward Marden now lives on”. Edward clearly has a wife named Charlotte at this point in time. I know for certain this is the wife he mentioned in his August 1820 Inventory because he specifically tied that spouse to this deed from Charles K. White. So now we know his 2nd wife was Charlotte and he mentioned in the inventory that she was aged 40, so born about 1780. Edward and Charlotte seem to have been married sometime between the prior deed of 20-Jul-1818 and this deed of 20-Mar-1820. the marriage location would most likely be Lyman. It appears that Edward continued to live on this land he sold to Charles White two years prior. Edward sold the land to Charles for $200 and now Charlotte is acquiring the land back from Charles for the sum of $50. My big question is why is this a Quit Claim deed and why for so little money? I learned in the prior deed that Edward was the lawful owner of the land at that time and he was willing to defend his title. Charles K. White received a good title to the land when he purchased it in 1818, so why is he only transferring his rights and not his title now? One explanation might be that Charlotte is closely related to Charles K. White. Could she be his sister, widowed sister-in-law, perhaps even a daughter? Another possible scenario might be that Edward and Charlotte were married before the 1818 deed to Charles White and intentionally did not give up her “right of dower”, in effect retaining an interest in the title of the property. Unfortunately, a search for Charles White in Concord in this time period turned up zip, nada, nothing at all! Since the 1820 Census for Grafton County has not survived, I would not know of his existence if it where not for these deeds. Do any of my readers see other possible explanations for this kind of deed to Charlotte?